Regent College is pleased to announce the launch of the John Richard Allison Library’s new website. The new site features a clean, mobile-friendly design, intuitive site-wide navigation, and easy access to important resources and services. It also includes this news column, which will provide regular updates on library news, special events, and new resources and databases. 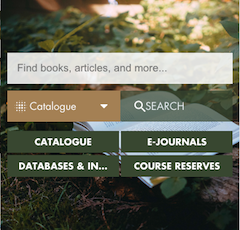 "We trust that the site's simplicity of design and user-friendly layout will support and encourage researchers of all kinds, from members of the public browsing through our digitized rare books to advanced students working on their dissertations. We look forward to continuing to improve the site as we receive valuable feedback from our users." Keep an eye on the site’s news section to track the release of even more exciting new features, like video tutorials and research guides on a variety of topics. We hope the new features and design make your research more efficient and enjoyable. If you have any questions or comments, we welcome your feedback here.